A compound microscope gets its name from the fact that it consists of not just one lens – but multiple double convex lenses. These lenses are positioned near the two ends of the cylindrical hollow tube. Since both lenses magnify, the resultant image you see through the microscope is magnified multiple times. The magnifying powers of the two lenses used, when multiplied one by the other, give you the total magnification that that particular compound microscope provides. The actual magnification is usually calculated in ‘diameters’. If lens can magnify an object to twice its actual size – the resultant image will be twice in diameter – and the magnifying power of the lens will then be 2 diameters. This is however, simply expressed as 2X. Realistically, when we talk of compound microscopes, the lenses installed in them are usually anywhere from 5X and can go up to 2000X for very strong microscopes. Keep in mind though that the product of the magnifying power of the individual lenses gives you the resultant magnification. Eyepiece: Choose one where you can see through clearly. This will be important if you are able to use it easily. Diopter adjustment: If you have myopia, or have a difference in vision between the two eyes – this will be an essential detail to look for. It’ll allow you to adjust for the difference in vision. Eyepiece lens: This is the first lens – that will provide part of the magnification to the image you see. So its power will count. The usually available options are 10x or 15x. Objective lenses: As you already know – this is what will multiply the power of the eyepiece lens. And the more magnification you want – the more you want this to be. Of course, with most good compound microscopes you will get a range – because they’ll have multiple objective lenses – the one in the image has 4 as you can see. The different objective lenses will have varying magnifying powers. Fine adjustment: Coarse adjustment option should be present – because this helps you to focus the image. But much more important is the fine adjustment – and this should be in keeping with your purpose. This allows you to throw the projected image into sharper focus and detail. The more magnification you will need, the better should be the fine adjustment. Illumination: This is important – as you want one that will provide illumination but without distorting the image. Choose wisely. Viewing head: This is another factor to consider – the viewing head can differ – you can have monocular (one eyepiece), binocular (2 eyepieces) or trinocular (3 eyepieces). The binoculars are most common, whereas the trinoculars allow a second person to look at the image simultaneously. As for all the other parts, you can find detailed information on all the different parts of a compound microscope here . But when you want to choose a microscope these factors should allow you to decide. This compound microscope is one of the best microscopes you could invest in, with full 8 levels of magnification. The 4 objectives are all achromatic – so minimal aberration and color correction have already been taken care of. As for eyepieces, you get two sets of these – one set of 10x magnification, and the other with 20x magnification. 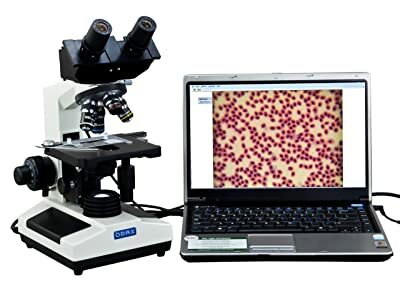 As for connecting the microscope with your Mac or PC, it is compatible and comes with the software required. It is correctly calibrated and doesn’t cost very much. The entire set up is also pretty strong and durable. Illumination from a 20W halogen lamp. Mechanical stage with 2 layers. Allows for co-axial coarse and fine focusing. Iris style diaphragm and filters. Of course, when you order it at Amazon, you get it for a super saver price as well – because they knock off quite a bit from the list price. They’re currently rated at 4.8 out of 5 stars, pretty favorable really – so long as the microscope matches your requirements. Currently, this scope has an average 4.7 out of 5 star rating from 73 customers at Amazon. 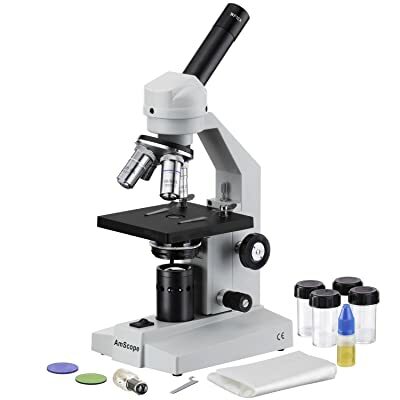 As most of the reviewers attest – this one is the most affordable and best performing microscope in its price bracket – and is a perfect fit for home or school uses. 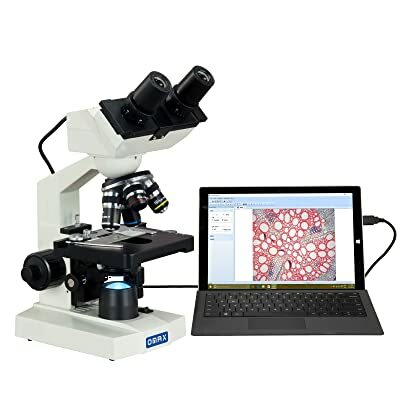 Of the top 3 products that we have reviewed so far, the best is of course the OMAX 40X-2000X Digital Lab LED Binocular Compound Microscope with Built-in 1.3MP USB Camera and Double Layer Mechanical Stage. It comes with quite a few different pluses and advantages that make it win hands down in comparison with the others. Also there’s little doubt that this product is good from the fact that Amazon is selling them very fast.